There has been a big change in recent years and people are much better at wearing reflective vests both on themselves and on their animals. The autumn darkness comes with leaps and bounds and the fact is that it is difficult to detect a dog or cat at dawn or dusk. Most accidents occur in densely populated areas with street lighting. “I who drive a lot of cars always see people who are without reflexes and it is very dangerous, you get dark. But I think people have become much better than if you take just five years ago. Purchasing reflexes is cheap life insurance,” says Mona-Lisa Karlsson. The labrador Nixon seems to feel fine in his reflective vest with a large paw on the side. Even Nixon’s leash is of reflexes and math Mona-Lisa wears a reflective jacket. Mona-Lisa says that there is also a reflective torch that flashes. When I and the dogs are out and about in the country, they have reflective vests that blink. There are great reflex products to buy and do not have to cost much. Something that is important is to keep the reflections clean, otherwise, they do not seem as good. When it comes to the cat, Mona-Lisa tells that it rarely works with the vest because the cat can get stuck. There you have to find a good reflective necklace that goes up if it should get stuck somewhere. In a press release from Agria Insurance, Patrik Olsson, business area manager at Agria Djurförsäkring, tells that reflections save lives by being visible at 140 meters when they are hit by spotlights against the approximately 20 meters without reflective materials. “The best effect gets the reflections if they are combined with a lamp. There are several variants of flashing lights that are easy to attach to necklaces, harnesses, and leashes. Something that not everyone thinks about is that reflexes wear quite quickly. Most people only last one year and then need to be replaced,” says Patrik Olsson. 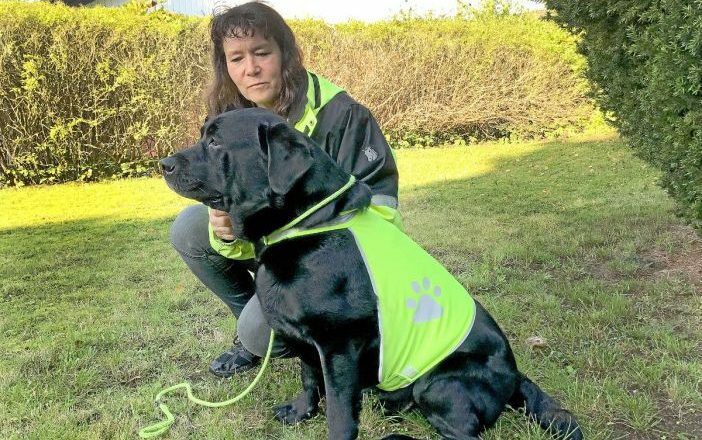 Reflective vests with reflective tapes that are washed, leashes exposed to wind and weather and common reflections that are associated with keys in the jack pockets age and need to be replaced. An easy way to check if the reflex needs to be replaced is to illuminate an old and new reflex at a distance of four meters. Compare the difference between the old and the new reflex and replace if someone is inferior. Combine a lamp with reflex on the dog. The reflectors are visible when struck by light, while the lamp is visible when it is completely dark. If your dog goes loose without a leash, it is easier to see where the dog is if it has a flashing lamp. Dogs with a strong coat are better visible with a reflective vest than with a reflex necklace. If you use a reflective vest on your dog, keep in mind that the reflections are only visible from the side and thus not from the front or from behind. Remember that there are good reflections also for cats. A reflex necklace (which dissolves if the cat gets stuck somewhere) on the outdoor cat can save lives. Make sure you also wear reflectors! With reflex straps attached around the wrists and traditional dangling reflectors ready in the pockets you can see well. You can best be seen with a jacket or vest in reflective material in combination with dangling reflections and a lamp.